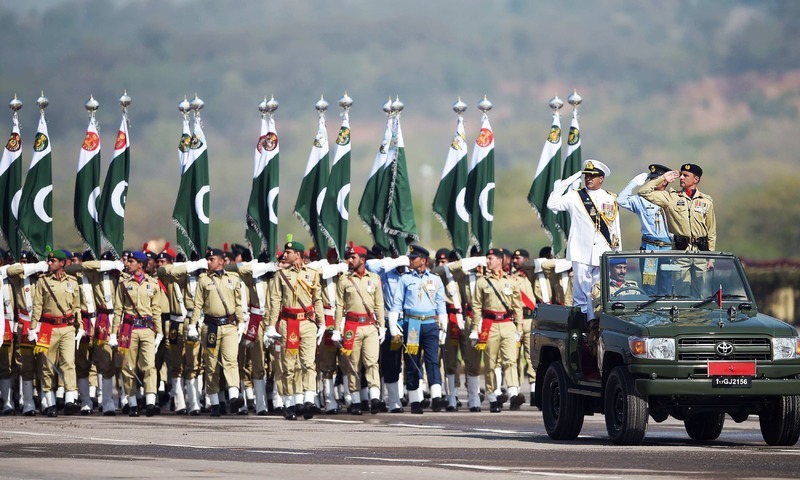 The armed forces are performing the joint military parade in Islamabad on Saturday to mark ’79th Pakistan Day’, annually observed to commemorate the passage of Lahore Resolution on March 23, 1940. 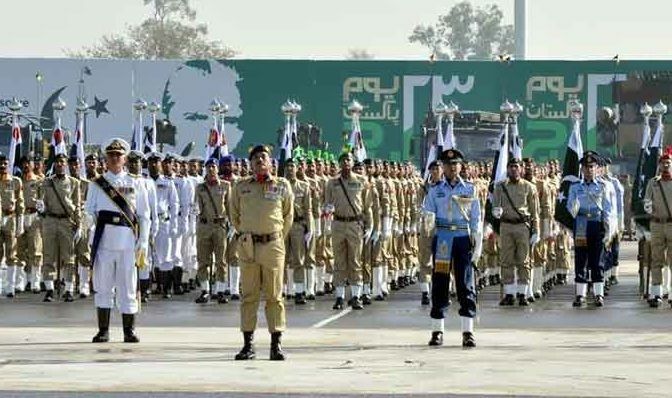 The joint military parade is being held at Parade Ground near Faizabad Interchange in which contingents of three armed forces and security forces will conduct march past while fighter jets will present aerobatic maneuvers. The march of different floats depicting various aspects of the culture of different provinces is also part of the parade. Various contingents from China, Bahrain, Azerbaijan, Bahrain, Turkey, Saudi Arabia and Sri Lanka will also take part in the parade. The visiting Malaysian Prime Minister Dr Mahathir Mohamad will be the guest of honor in the Pakisan Day Parade. While Azerbaijan’s Defence Minister Colonel General Zakir Hasanov, the Bahrain’s Chief of Army Staff (COAS) Khalifa bin Ahmed Al Khalifa and government officials from Oman will also participate in the parade. Likewise, President Dr Arif Alvi, Prime Minister Imran Khan, three services chiefs, senior military officers, diplomats and the people from all walks of life will also witness the parade. Earlier the Day dawned with 31-gun salute in the Federal Capital and 21-gun salute in Provincial and State Capitals. Special prayers were offered in mosques after Fajr prayers for the progress and prosperity of the Country. The national flag was hoisted on all major government buildings. Later in the evening, an investiture ceremony will also be held at Aiwan-e-Sadr where President Dr Arif Alvi will confer Civil Awards on individuals demonstrating feats in different fields of science and arts. As many as 171 personalities including some foreigners have been selected for awards. In addition, different organizations and societies have also arranged functions and ceremonies to commemorate the Pakistan Day and inculcate a spirit for the progress, prosperity and defense of the Country.